Eighteen months ago, I sold my house and moved in with two female friends. Many women, finding themselves alone, talk about one day buying a big house and moving in together. We actually did it. 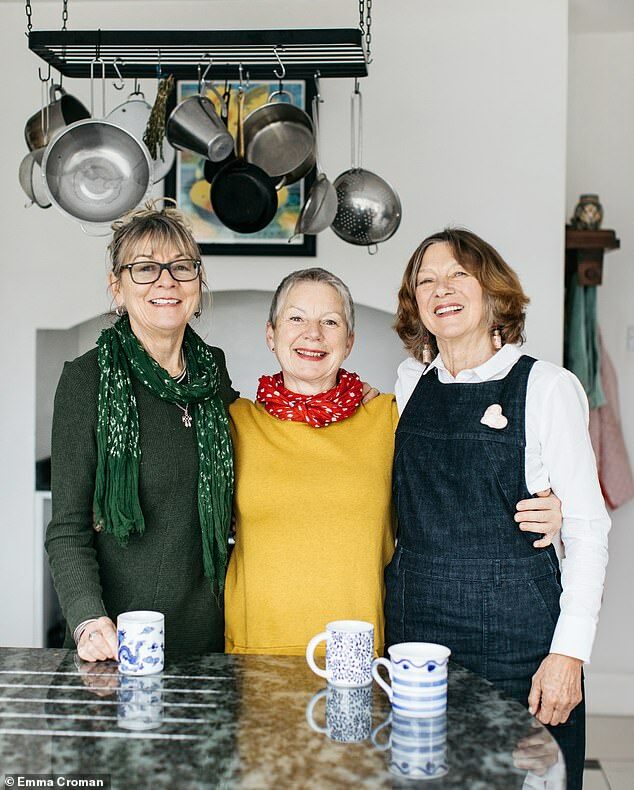 But when Sally-Mae Joseph, Lyn Sands – both 60-something divorcées – and I, a 71-year-old widow, announced that we were selling our respective homes and pooling our resources to buy a large property, most people said we were bonkers. The naysayers fell over themselves with ‘what if’ and ‘it will never work’ comments, while the reaction from our families – we have eight children and 13 grandchildren between us – ranged from accepting to incredulous to horrified. 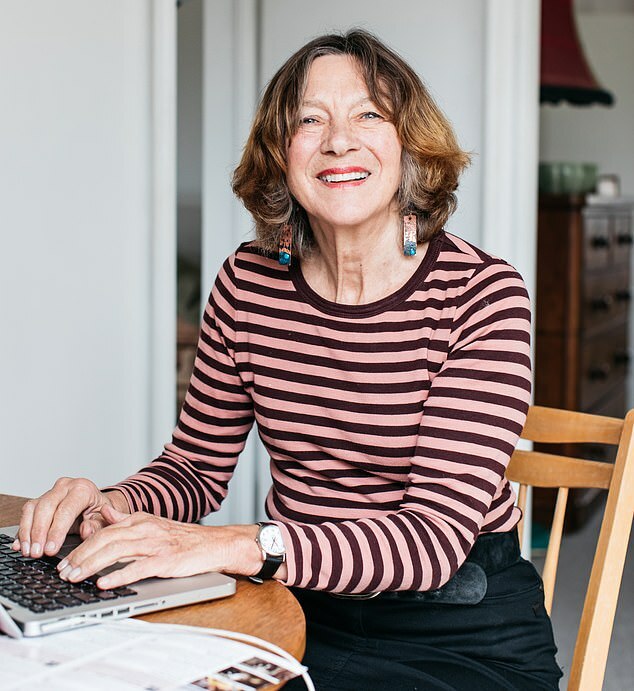 They advised us to think very carefully about what we were contemplating – not least the legalities such as inheritance and what would happen if we fell out. I explained to her that after seven years of widowhood, I sometimes felt very lonely and missed having someone to share my day with. And living with my friends would mean we’d be there to look after each other and share the chores. 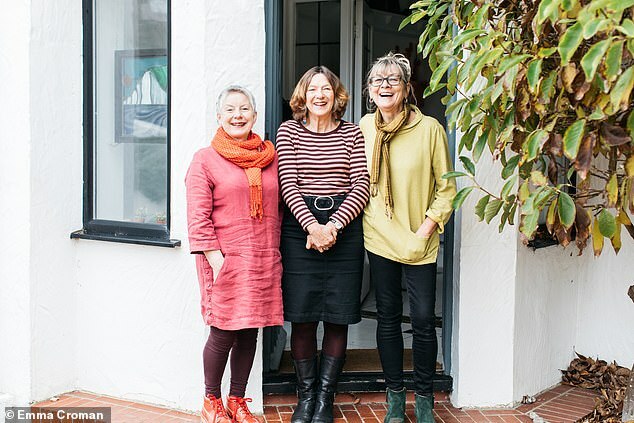 It all started when Sally-Mae, our baby at 66, was downsizing and thought that she could make communal living a reality. At that point four of us were up for sharing a house on the Sussex coast. If privacy is important don’t consider sharing. You don’t want to live in your bedroom. Be prepared to share space, food, drink, household goods and chores with no pettiness. Have a cleaner. Arguments about who washes the floor most are best avoided. Bring no more than one ‘must’ to the agreement: Sally-Mae’s was her studio, Lyn’s was eco-living and mine was using all my furniture. Ignore naysayers, but listen to your children. They only want what’s best for you and are worried they might have to sort out a big mess. Get sensible legal agreements drawn up. This may not be a forever way to live. Discuss your objectives and find solutions to obstacles. If you can’t, then don’t go ahead. Decide how you feel about future romantic relationships. We have a rule – so far untested – of no canoodling in public and no undue noise behind closed doors. Sitting in a café doing the sums, we were amazed to discover that we could afford it if we put in equal shares of equity from the sales of our modest houses. The next day, standing in the spacious black-and-white tiled hallway, our hardest job was to restrain ourselves from a humongus, ‘Yesssss, we’ll have it!’ and try to assume a little decorum as we were shown a huge living room, a kitchen big enough to seat ten, a room for craft projects and four double bedrooms, one of which has floor-to-ceiling windows overlooking the classically landscaped garden and an adjoining room with freestanding bath plus a shower room. ‘Er, how are you going to choose your bedrooms?’ asked the estate agent, sensing bubble-bursting potential. Enter the naysayers again: you’ll never sell your places and complete together, they said. Well, we got lucky, sold our respective houses immediately and moved into our new home three months later, deeds of trust in our hands that tie us into the property, with financial penalties if we want to leave before three years are up. We celebrated my 70th birthday four days after we moved in with a party for 100 people, having unpacked most of our 250 boxes and even got a few books and pictures up. And that set the bar, really. 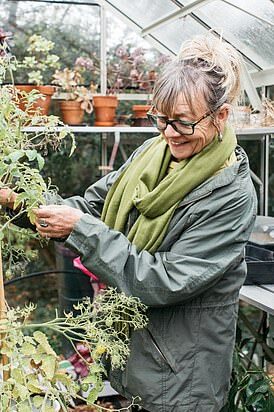 In the first few months we renovated the kitchen, had 28 six-metre, light-stealing conifers taken down, installed a wood-burner and a large greenhouse for Lyn’s tomatoes, aubergines and peppers, cut turf to create raised beds for more veg and enlarge the flower borders, and Sally-Mae had a garage converted into a studio where she can paint. Yes, we disagree from time to time, usually about things such as when we should turn on the central heating or whether we should have another party so soon after the last one, but so far we’ve resolved issues by discussing differences and working around them, while trying to respect wishes that are strongly held. For instance, we all wanted a wood-burner. Sally-Mae and I had fallen in love with a model we dubbed the Teletubby, but Lyn hated it and wanted a more traditional design. However, she was quick to recognise its green credentials, so Teletubby now warms us cosily. Of course, life doesn’t always go to plan. Take the chickens, which are my responsibility. Almost as soon as my son Paul gave them to me, Fox World must have tweeted that a novice was in charge, so I lost two early on. The remaining ‘girls’ kept vaulting the fence (which was advertised as too high to fly over), so Sally-Mae and I googled wing-clipping and became chicken chasers, rugby tackling each bird before shoving her under an arm so we could cut her flight feathers. Would I have kept chickens without the support of the other two? No – who would have looked after them when I was away? So thanks, Sally-Mae and Lyn. Our girls bring great joy and delicious eggs. That they now have an electric fence around them is down to Sally-Mae, who spent hours working out how to install it while I looked on gormlessly. As a group of housemates we have a broad range of skills. 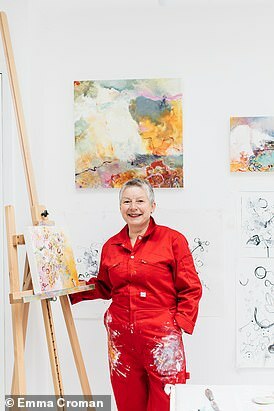 Sally-Mae, whose glass is not just half full but brimming over, is a retired calligrapher, fizzing with ideas for her paintings. Lyn, who used to travel to the Far East for her fashion business and retired early to renovate a house and create a garden on her own in Spain, is a whiz at figures and finding the cheapest and best deals. They are both great at DIY – unlike cack-handed me, a retired journalist. I don’t know what I add to the house except muscles and a slightly better head for heights when climbing ladders. One thing we can all do, having brought up children (Sally-Mae has four, and Lyn and I two each) is cook. But – and this is quite a big but for me – Sally-Mae and Lyn don’t eat meat or wheat and would prefer not to have cow’s milk or sugar. I have tried to make chickpeas and lentils palatable but usually resort to fish when it’s my turn to cook supper. Incidentally, we’re always being asked who does the weekly shop. Answer: we don’t do one. We have a blackboard shopping list and whoever is cooking that evening sees to it. Simple. We pay for it from a kitty purse to which we contribute a weekly sum covering day-to-day household needs, food and alcohol. Utilities and contingencies come out of an account fed by standing orders. We all like a glass or two of wine and that sort of goes with how we live. With some shared friends plus separate pals, the house can feel like a permanent party as various people visit, eat and sometimes stay with us. We keep a calendar on which we mark things such as guest room use and we confer about who we’re inviting for a meal and when to avoid clashes, and usually ask the others to join in. The house is large enough to provide several spots for privacy, whether it’s having quiet chats with friends, reading or telly-watching. In practice the only time we all sit down together is to watch a drama at 9pm, almost invariably falling asleep and having to re-watch it on catch-up. Life’s just too busy with things to plan and chat about. Take Christmas, for example. Anyone with adult children will know how hard it can be to pin them down, but it so happened that last year Sally-Mae’s tribe – she has nine grandchildren – wanted to come for Christmas. I was away with my family but Lyn joined in and had her own family over later. We decorated an enormous branch taken from a conifer in the garden with assorted baubles that we’d collected over the years. This year Lyn will be hosting Christmas for her family while Sally-Mae and I are away with ours. Next year, who knows? We cherish the idea of getting all our children, partners and grandchildren together for a family day. We have come close to it with a firework party and an Easter egg hunt, but Christmas may be an indulgence too far because there will always be so many people to please. So have we changed in the 18 months that we’ve lived here? Pondering this, we could only conclude that we have gone on raising the bar. We have taken rash decisions, from ripping down curtains and bashing down a marble shelf on moving day, to taking on big projects such as having an open house over two weekends, showing local art (with Lyn cooking in the garden, live music provided by our own band, the Pop Up Singers, with whom Sally-Mae and I plus friends entertain at local functions and care homes) and a willow sculpture workshop – things I would never have had the confidence to do on my own. Tomorrow we’ll be shopping (independently) for a Sunday lunch party for nine family and friends, with ages ranging from 97 – my mum – to nine months, Sally-Mae’s newest grandchild. They’ll be eating nut roast cooked by Sally-Mae, chicken cooked by me and veggies grown and cooked by Lyn, with blackberry and apple crumble from our own fruit. And our doubting children? Zoë, visiting recently to celebrate my mum’s birthday, observed: ‘Mum, your friends are lovely and I can see why you are so happy.’ On with the adventure, I say. Well, the practical side has never been a problem as we have a cleaner and take it in turns to cook and shop. And yes, we have remained friends. From the outset I realised that I had to let go, accept change and, through discussion and compromise, find a new way of doing things, without losing my individuality. The dynamics of three very different, strong, independent women has been interesting, but I can honestly say that I have not regretted this experience and would thoroughly recommend it. We all have our own outside interests, but coming together in the evening over supper gives us the chance to share our day, have a laugh and plan future joint excursions. It is a privilege to get to know, support and be supported by two amazing women. These past 18 months have been full of new projects, getting to know my housemates and carving out a new life for myself. It has been good to have support in stressful times, rather than coping on my own. I wanted to live in a more sustainable way and growing our own fruit and veg is one aspect of this. We changed an unproductive lawn into a vegetable patch with raised beds and bought a good-sized greenhouse so all our plants can be grown from seed. I could not have afforded such a big garden or greenhouse on my own, or achieved so much without Andrea and Sally-Mae’s support, having someone to do the watering if I’m away or help move barrow-loads of manure. Housesharing has given me the opportunity to do what I’m passionate about.